Walking on frozen streams and camping by the Chandra Tal Lake are a few things to do on this trek. Hampta Pass gets its name from the Hamta Village located at a staggering altitude of 14,000 feet in the Pir Panjal region. It’s famous for its trekking route and rightly so; while you traverse the mountains passes from Manali to Chandra Tal Lake, the beauty around you is surreal. 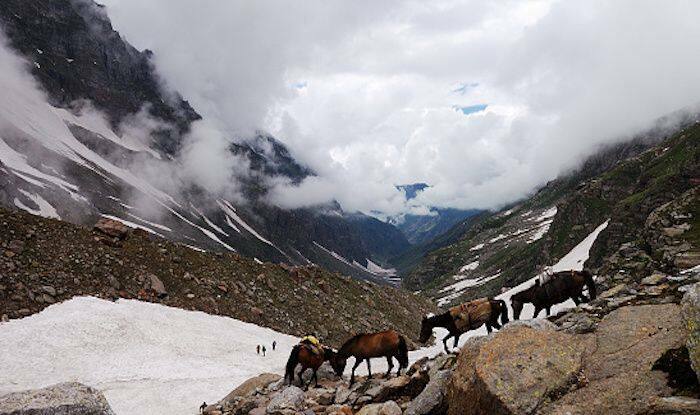 From glaciers, rivulets to jagged mountains, and lush meadows, Hampta Pass Trek is one that stays with you forever. The trek is also called the Hampta Pass Chandra Tal Trek; the reason being that the incredible journey comes to an end at Chandra Tal Lake, one of the most sought after attractions in the Spiti region of Lahaul district. The trek is quite challenging, but well worth it, because the experience of spending a night camping at this crescent moon lake is absolutely unparalleled. For a unique experience, do some simple yoga exercises by the turquoise water of Chandra Tal Lake at sunrise. However, you must keep an eye out for the natural wonders on your way up here as well. Such as the Hanging Valley, that will leave you astounded with the views. The valley is a short walk from the Jobra village, through dense forests, that give way to vast expanse of grasslands surrounded by high mountains that play hide and seek with the clouds. Hampta Pass is also famous for the many meandering streams and cascading waterfalls. And on your trek, you will be required to cross over many streams, sometimes barefoot. It’ll be something to dip your feet in the mind-numbingly cold waters and continue the trek. You are also going to spot some of the most gorgeous flowers on your way, of every possible colour you can think of. The highlight of this trek is walking on snow passes and snow bridges. Basically, the streams have a thick layer of snow on them during winter, and when you walk on them you can hear the gurgling song of the water flowing underneath. This one’s an experience of a lifetime.